Limestone that forms the foundation of coral reefs along the Florida Reef Tract is dissolving during the fall and winter months on many reefs in the Florida Keys. The study, titled "Dynamics of carbonate chemistry, production and calcification of the Florida Reef Tract (2009-2010): evidence for seasonal dissolution," was published in the May 2, 2016 issue of the journal Global Biogeochemical Cycles. The co-authors include Langdon, UM Rosenstiel School alumnae Nancy Muehllehner and Alyson Venti, and David Kadko, now at Florida International University. National Science Foundation funded the study. For two years, the researchers from University of Miami (UM) Rosenstiel School of Marine and Atmospheric Science collected water samples along the 200-kilometer (124-mile) stretch of the Florida Reef Tract north of Biscayne National Park to the Looe Key National Marine Sanctuary. The data provide a snapshot on the health of the reefs, and establish a baseline from which future changes can be judged. 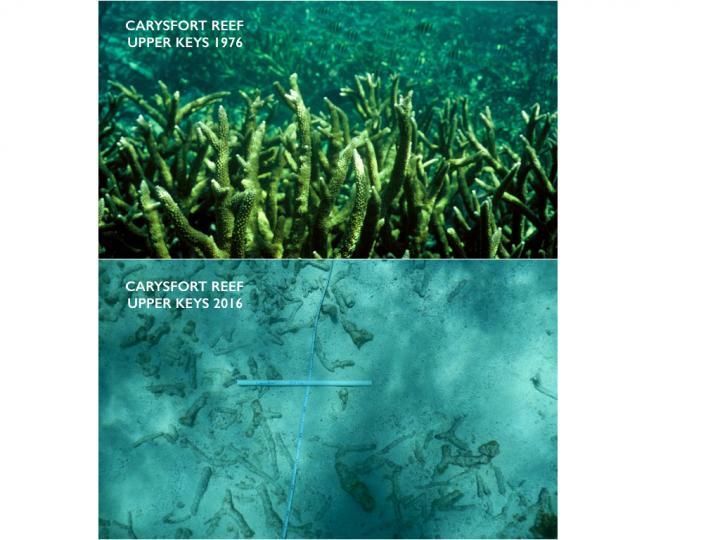 The results showed that reef dissolution is a significant problem on reefs in the upper Keys with the loss of limestone exceeding the amount the corals are able to produce on an annual basis. As a result these reefs are expected to begin wasting away leaving less habitat for commercial and recreationally important fish species. In the natural scheme of things in the spring and summer months, environmental conditions in the ocean, such as water temperature, light and seagrass growth, are favorable for the growth of coral limestone. While, during the fall and winter, low light and temperature conditions along with the annual decomposition of seagrass, result in a slowing, or small-scale loss of reef growth. However, as atmospheric CO2 is absorbed by seawater, ocean pH declines. The result is that the natural summer growth cycle of coral is no longer large enough to offset the effects of dissolution from ocean acidification.